Intrigue, action, corruption, shady deals; lawyers on the edge of the law. Clues and evidence spill out from a plot that surprises with every chapter. At the same level as the great American writers of the genre, a Spanish author, Carmen Gurruchaga, has written a legal thriller to show that our experience can be just as or even more exciting than elsewhere. Flesh and blood characters, a puzzling set of cases that seem to fi t together perfectly, involving situations that we live and read about every day. A brilliant literary début by an author known for the sharpness of her quill. A novel that can leave no reader unmoved. Premio Abogados de Novela 2010. A brilliant literary début, a novel that will leave no one indifferent. 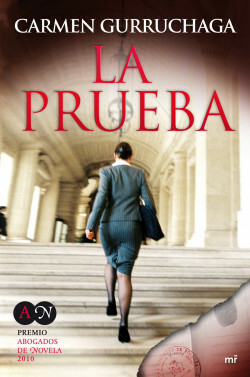 In La prueba, Carmen Gurruchaga plunges into the legal thriller to portray an enthralling reality of lawyers who are on the edge of the law.